6 of the best fruits for babies - breast milk is the best source of nutrition for babies. But after six months, you should slowly begin to introduce solid foods as complementary foods for your baby. 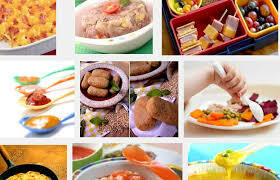 That is why the food provided must also be nutritious so that the baby has healthy growth later. But the thing is, you can't carelessly feed your little one. Because they are still difficult to swallow and digest foods that are hard. Hmm ... what then, yes, food that is nutritious, easy to eat, but still delicious? The answer is fruits. Yep! Pure fruits are easy to serve, rich in vitamins and nutrients, and also have a delicious taste. Here are some fruits for babies that are good for consumption. Apples have many nutrients such as potassium, phosphorus, calcium, magnesium, vitamin A, and vitamin C and other minerals that are very good for growing children. Besides being easily digested, apples also don't cause allergies for your little one. You can give an apple to your child in the fifth or sixth month. You can actually introduce bananas from the age of four months, but ideally, the recommended age for starting solid foods is six months. Bananas are fruit for babies which are often used as complementary foods for the best breast milk. Because, this fruit has a soft and smooth texture, so it does not make it difficult for your child to crush or digest. In addition, bananas are easily obtained at relatively cheap prices. You can choose Ambon banana, golden banana or milk banana. Most importantly, choose a banana that is ripe if it will be given to the baby. The fruit for other babies is avocado. Avocados are a source of unsaturated fats and vitamin E. In addition, avocados have a soft texture and have a good taste, making them suitable to be used as complementary foods for breast milk. Kiwifruit is rich in fiber and vitamins A and C. However, acidic properties can sometimes cause diaper rash or oral rashes. Therefore, be careful to see any signs of allergies when you give them to the baby for the first time. Papaya in addition to sweet and delicious is also rich in folate, fiber, and vitamins A, C, and E. The fiber and enzyme content of papine contained in papaya is very good for baby's digestion. Therefore, many people make papaya as a natural remedy to overcome constipation problems. Guava is rich in vitamin C and helps boost the immune system . Food fiber in this fruit can also improve digestive health.